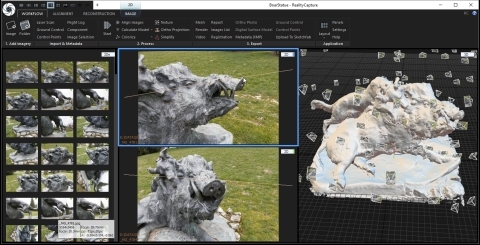 Capturing Reality has released new version of RealityCapture photogrammetry software that allows you to directly upload your model reconstructed from images to Sketchfab. Sketchfab is a website used to display and share 3D content online. The company behind it has been launched in France and is based in Paris and New York City today. It provides a 3D model viewer based on the WebGL technology that allows to display 3D models on any mobile, desktop webpage or VR headset. Michal Jancosek, Managing Partner at Capturing Reality: "We’re happy that our users can now directly share their creations on the Internet easily and fast. This feature makes our software even easier to use. You just need your camera, our software to share your 3D captures with your friends through Sketchfab on Facebook, Twitter, Reddit, LinkedIn … in 3D and in virtual reality. You don't need to have any third-party software. You also don't need to waste your time on exporting, zipping, uploading etc. You just need to press one button now." 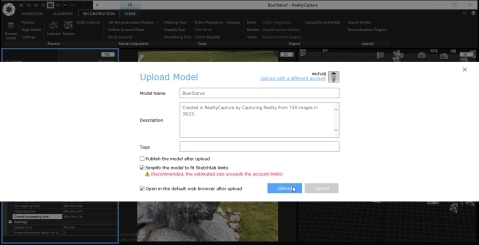 You can also visit the RealityCapture dedicated tag page to explore more. Capturing Reality, based in Slovakia, has created RealityCapture - new photogrammetry software. It is faster than you expect and it can produce 3D models of unlimited size. Moreover, it is the only software which is able to mix lasers and photos easily without seams and limitations. Capturing Reality is a young company which has officially started selling RealityCapture licenses publicly via its webpage just in February this year. It is selling the product on Steam now too.